Sick of having a boring image as your wallpaper on your Windows PC Make Your Desktop Stunning With an Interactive Live Wallpaper Make Your Desktop Stunning With an Interactive Live Wallpaper Nothing makes your desktop stand out like a live interactive background. It's also one of the greatest exercises in customizing your Windows setup. We'll show you how to do it easily with Rainmeter. Read More ? Well, you’re in luck, because today we’re going to show you how to set a website as your wallpaper in Windows 10! First, you’ll need to download an app called WallpaperWebPage. It’s not a perfect solution, and it has some drawbacks (which we’ll get to in a bit), but does let you put a desktop on your wallpaper, as promised. Once you download and install the app, an icon will apear in the system try. Right-click it, and then select Configure. Enter the full domain for the webpage you want, and it’ll appear on your desktop. There’s also an Autostart option that will let you choose whether you want the program to run at launch. Doesn’t replace wallpaper, but rather overlays on top of it. 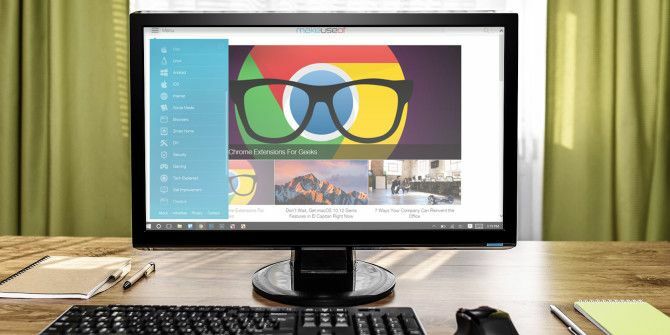 This means you can’t see icons or the traditional desktop context menu 10 Best Shortcuts to Add to Your Right-Click Menu 10 Best Shortcuts to Add to Your Right-Click Menu The context menu that pops up whenever you perform a right-click can help you become more productive. With the right tool, customizing the shortcuts within it is a breeze. Read More . Some sites had script errors 10 Silly Windows User Errors That Actually Happened 10 Silly Windows User Errors That Actually Happened Working in tech support is hard. Troubleshooting skills and patience are the corner stones of this craft. But even the most seasoned tech support pros would struggle with these unusual, and occasionally unbelievable, errors. Read More that would keep popping up every time it auto-reloaded. Again, it’s not a perfect solution, but I did find success with setting MakeUseOf as the wallpaper, and Google worked great, too. A pro wrestling site The Best News Sites for Pro Wrestling Fans The Best News Sites for Pro Wrestling Fans Love watching professional wrestling? You probably want to have your finger on the pulse of the wrestling world. Catch the latest with these news sites. Read More that I visit regularly had constant errors, and I wasn’t able to use it. What website do you want as your wallpaper? Let us know in the comments! Explore more about: Wallpaper, Windows 10, Windows Tricks. ^^ You're right, Ionut. If at first you don't succeed, tray, tray again. "an icon will apear in the system try."